Before we get started on today’s quick little update, I just wanted to remind you that the focus combat is receiving in this devlog doesn’t reflect the focus I’ve been giving it in development time! It’s just much easier to talk about in a devlog format than narrative stuff. With that little disclaimer out of the way, let’s take a look at boarding and melee combat. In combat, I always intended the Distance between the battling vehicles to be a big deal. Neither you nor the enemy can flee combat unless you’re over 200M away from each other. Similarly, neither you nor the enemy can board each other’s vehicles unless you’re under 50M away from each other. But if you do get too close, enemy Guards can fire their grapnels and leap onto your speeding train. And, of course, the player can send their Guards to do the same. 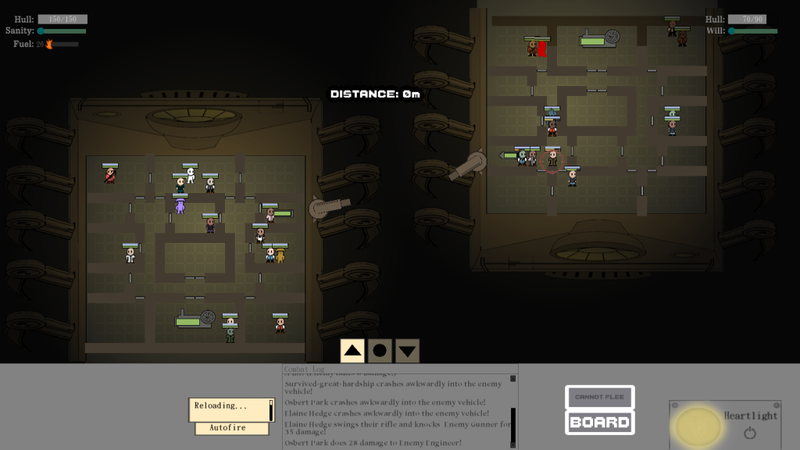 Only the Guard Captain and the Guards in your crew can board, but it can be extraordinarily effective, and it’s completely changed the way that combat plays out. 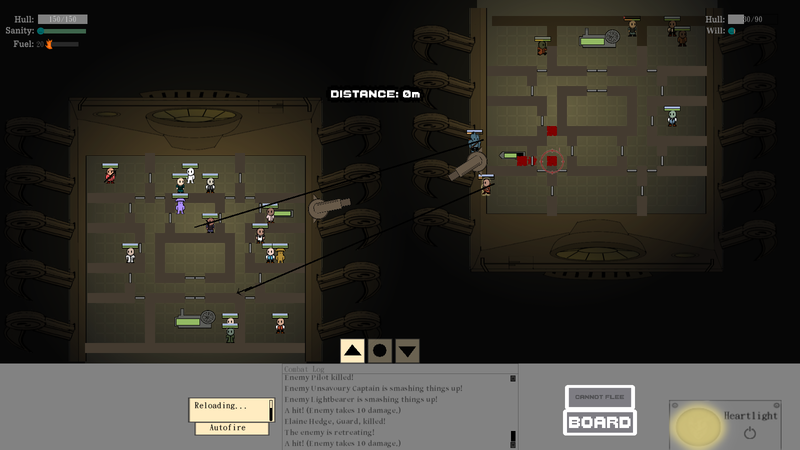 After boarding, you send your Guards to sweep through the enemy vehicle, kill everyone inside, and take it intact – which means more loot, because less is destroyed than if you were to blow the enemy into smithereens via artillery fire. The trade-off, of course, is that when you’re in Boarding range the enemy can also board you – and it might be a bad idea to send your Guards over to the enemy vehicle when your own has been invaded and the rest of your crew will need defending! Another trade-off is the risk of blowing up your own Guards, so be very careful with where you’re aiming your artillery. And finally, you can’t send your Surgeon over to support your Guards when they’re boarding – making combat riskier and deaths more likely. 1) The cautious player, who focuses on upgrading their artillery and engines so they can always maintain a safe distance from their enemy and bombard them from afar, as well as building up their Guile and Vigilance. These statistics allow them to more easily dodge enemy missiles, and to escape combat if they need to. 2) The high-risk high-reward player, who concentrates on building up a personal army of Guards, building up the Grit and Guts statistics (both of which make melee combatants more effective), and rushing towards the enemy as fast as they can. 3) There’s also the peaceful player, who avoids combat where possible and hides from enemies in the shadows, building up their Spirit statistic to avoid losing Sanity. This is totally valid too, and since combat doesn’t give out “XP,” a pacifist playthrough isn’t punished mechanically. You don’t become more powerful by killing things, but by exploring a lot and writing lots of poetry. I expect players to broadly stick to one playstyle, but switch it up when necessary – a high-risk player might become cautious when their Hull has been torn to shreds and half their Guards have died. A cautious player might go for the high-risk approach if they’re at full strength and fighting a much weaker enemy. There are also various weapons that are tied to the Distance mechanic, as well – so a cautious player might invest in a biomechanical spinneret that ties their opponent up in webs, slowing them down and keeping them from getting too close, while a high-risk player might prefer the one-use-only harpoon that does huge damage and lets them drag the enemy towards them even faster. Beating up the crew of the enemy vehicle. How does melee combat work? Basically, the player parks a character next to an enemy, and they automatically hit each other. It’s simplistic, but I think the complex mechanics surrounding that interaction make up for it – as well as the fact that crew placement is key to keeping your kinetopede’s systems working, so making your Gunner run away from an enemy Guard who’s boarded your vehicle can have tactical consequences. Oh, and melee combat also ties into another system, of course – insanity. It’s all very well building up your Grit statistic and making sure your Guards do a lot of melee damage. But if one of your Guards goes berserk and starts attacking the rest of your crew, you might come to regret it. 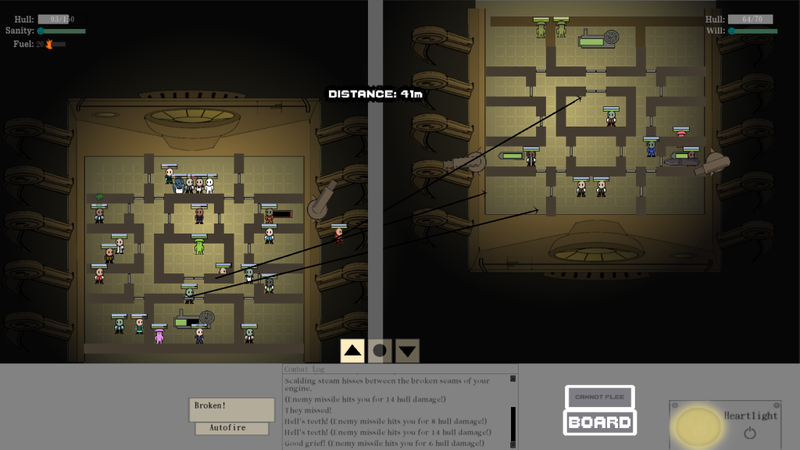 Your boarders return after killing most of the enemy crew. The few who are left have gone mad with grief and started smashing up their own engine. Anyway, there you go! Various grisly amusements to entice the mind and temporarily satiate your inner demons. I hope it all sounds interesting enough – do let me know what you think. Oh, and by the way, HOMD artist Catherine Unger has been knocking out some stunning art. I’m sure you’re bored of my words by now. Here’s something delightful and worth at least a thousand of ’em. This is Fargyle Keep – seat of the Poet-Knights, who can decapitate a man in less than seven stanzas. 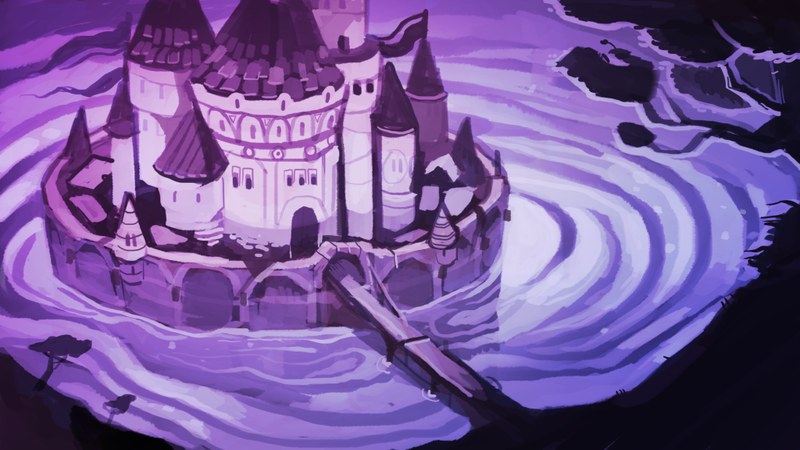 Their castle is surrounded by a moat of glimmering mercury, and they fight not for morality or money, but for aesthetic truth. Aesthetic truth is always a noble thing, but not necessarily a thing that is good or right or kind..
Catherine Unger’s work can be found here, and Zach Beever’s website is here. For those who aren’t vomiting at the thought of reading even more words that I write, you can follow me on Twitter here, and you’ll be vomiting soon enough. For the rest, well, I have bad news about the game whose devlog you’re reading.